In August of 1981, joint committees of the U.S. house and senate released the final report of the Select Commission on Immigration and Refugee Policy (SCIRP), entitled U.S. Immigration Policy and the National Interest (1981). Based on years of work, the final report of the commission recommended “closing the back door to undocumented/illegal migration, opening the front door a little more to accommodate legal migration in the interests of this country” (U.S. Congress 1981, 3) and stressed the need to work with other countries to improve the conditions that cause migration and exile (Fragomen 1981). Through this newsletter, we see proof of the difficulty of true immigration reform. There are competing interests, complex economic issues, and issues of inequality to grapple with before immigration reform can make necessary changes. Cline was apt in noticing the effect of shifting conservative attitudes towards immigration and the difficulty of creating workable immigration reform in the face of public misinformation and misunderstanding. A few years later in 1984, a New York Times article speculated that Cline was a driving force in the collapse of a comprehensive immigration reform bill the year before (Pear 1984). Despite the work of the Select Commission in years prior, there were still a multitude of competing interests standing in the way of immigration reform. The bill in question forbid employers from hiring illegal immigrants and was opposed by many Hispanic immigrant rights groups because of fear of employment discrimination. The article quotes Lawrence Fuchs, executive director of SCRIP, who said that Cline believed immigration reform to be “impossible” (Pear 1984, 3). 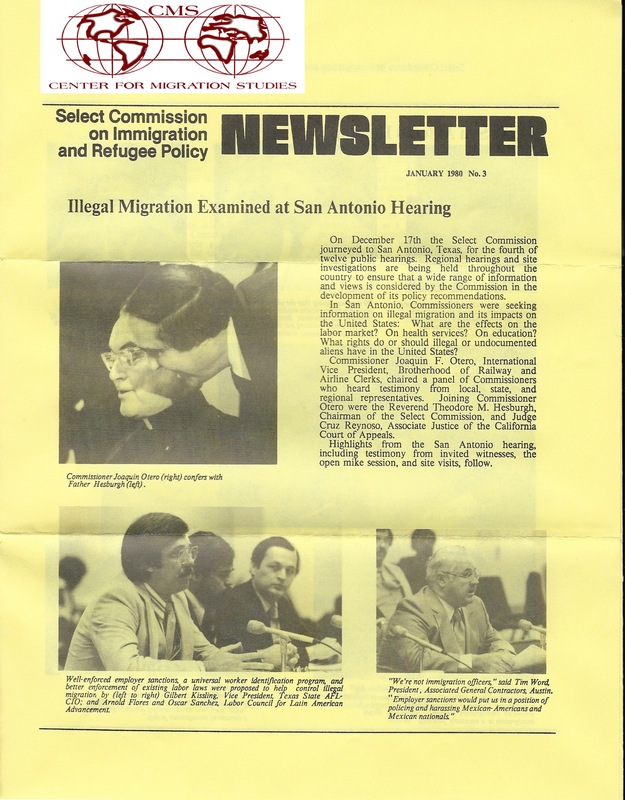 Spending the time and money on forming a select commission on an issue speaks to a certain kind of optimism that a problem can be solved or improved, but many of the quotes from the quotes from this 1980 newsletter sound quite familiar in 2018, suggesting that not much has changed in terms of the roadblocks facing immigration reform and the lives of immigrants themselves. As Vernon Briggs (1982, 11-15) argued shortly after the SCIRP published its final report, immigration is both an economic and human rights issue. Favoring one side of the issue while ignoring the other often leads to stalemate. Briggs, Vernon M., Jr. 1982. “Report of the Select Commission on Immigration and Refugee Policy: A Critique.” Texas Business Review 56, no. 1 (January 1982): 11-15. http://digitalcommons.ilr.cornell.edu/hr/36/. Fragomen, Austin T., Jr. 1981.”The Final Report and Recommendations of the Select Commission on Immigration and Refugee Policy: A Summary.” The International Migration Review 15, no. 4 (Winter 1981): 758-68. http://www.jstor.org/stable/2545523. Pear, Robert. 1984. “CONGRESS; ON IMMIGRATION, A POWER BEHIND THE SCENES.” The New York Times, April 7, 1984. https://www.nytimes.com/1984/04/07/us/congress-on-immigration-a-power-behind-the-scenes.html. Select Commission on Immigration and Refugee Policy. 1980. “Illegal Migration Examined at San Antonio Hearing.” Select Commission on Immigration and Refugee Policy Newsletter No. 3 (January 1980): 1-4. Select Commission on Immigration and Refugee Policy. 1980. “Who’s Who in Immigration.” Select Commission on Immigration and Refugee Policy Newsletter No. 3 (January 1980): 4-5. U.S. Congress. Committees on the Judiciary. 1981. U.S. Immigration Policy and the National Interest. 97th Cong., 1st sess. Cong. Rept. August 1981. https://babel.hathitrust.org/cgi/pt?id=umn.31951p00822404d;view=1up;seq=3. U.S. Congress. House. Committee on the Judiciary. 1980. Semiannual Report to Congress – Select Commission on Immigration and Refugee Policy. 96th Cong., 2d sess. H. Rept. October 1980. https://babel.hathitrust.org/cgi/pt?id=pur1.32754075463319;view=1up;seq=1. This entry was posted in Center for Migration Studies (NY) and tagged Center for Migration Studies, Garner J. Cline Papers, Immigration, Immigration reform, Select Commission on Immigration and Refugee Policy. Bookmark the permalink.